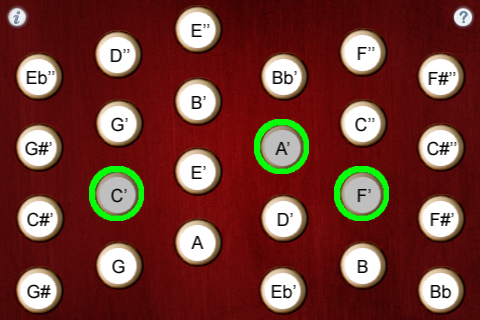 Canntina is a high-quality, easy-to-play, MacCann-style duet concertina with Treble and Baritone ranges. The button layout matches the center portion of the right side of a MacCann-style duet concertina, providing a Treble range from G4 to F#6 and a Baritone range from G3 to F#5. To play, simply press the buttons. Learning mode (touch the '?' icon) shows the note names for each button. Touch the 'i' icon to bring up the settings page. You may play along with the tunes on your iPhone or iPod Touch, just start the music before running Canntina. Using Apple's Settings app, you may configure your device to bring up the iPod music controls by double clicking the home button to change tracks within an album. Uses extremely high-quality audio samples recorded from a high-end concertina. 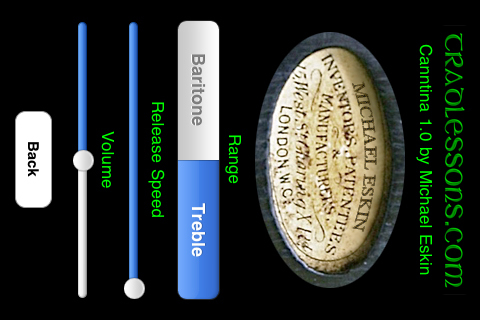 Please visit the app website for links to additional information about MacCann-style duet concertinas. Minor bug fix for potential stuck note issue.